Return to A digital ontology. This work, initiated during the 1990's, is now developed in Mankind. Globally, this article tends to show that human nature is less "something given" than "something decided", more or less consciously, by mankind in the course of its emergence and growth. So, human species would not be exceptional by its nature, but by its decision to be exceptional. - Human beings are radically different from any other beings, animals as well as machines. - Mankind must grow and dominate the world, and never transfer this responsibility to machines. But these principles are more and more difficult to justify and/or to apply. However, part from them sets issues of the most dramatic importance. - decision processes are digital: the binary choice of life and death, and the programmatic aspects of intervention, as well as the textual nature of law (though the text may be limited to specify a "human" decision process, residing basically in "absolute conviction" of a person or a group of persons. These issues take all their dimensions in our times, when the "word" has become really powerful through law, science and computer technologies, and the same time the textual nature of life is more and more deeply known. In some way, nature and art converge as just different ways of sending our "word" into the "world". Let us just hope that it will be more welcome that in the St John's gospel! The hardware/software distinctions emerge with the first computers, from the mere fact that a unification rule is imposed: machine will acquire programs and data through the same channel (Von Neumann machine). By this time, punched cards and tapes. In both cases, they are sequences of characters (decimal on punched cards, binary but grouped in 6 or 8 holes per line on tape), what we call call "rasters". A program is a command sequence. Data are what is processed. So are separated operands from operators. Human exception The human beings are radically different. Different from animal as well as machine. But not gods anyvay, even if somehow they may "become God"
- with computers, since artificial intelligence makes steady, though very slow progress. At birth, with the pro-life/pro-choice issues. At death and degradation with euthanasia or any voluntarily ended life. Or with criminals. With animals, the issue has lengthy origins, with high points in the French repression of catharism during the Middle Ages, for instance. And practical aspect, since we eat animal meat... which has made question for long: it is evoked in the first chapters of the Bible, after the salvation of the Noah family! Mankind was borne with two digital roots : genome and language. These two points may, in a first approach, separate him radically from any other kind of being. Genome: is human only who is child of two other human beings, who bring him a combination of human genomes.Genomics has confirmed the specificity of human genome... along with the few number of specific human genes. Language : if tools and some kinds of symbols are considered important marks in the emergence of man, articulate language is the more meaningful step. It is on this point that |Schaeffer 2007] elaborates his reflexions on human exception, starting from Husserl's positions. With the years passing and science growing, the limit seems more and more thin with the most advanced monkeys. It goes so for our early ancestors, with apparently progressive acquisition of human traits, from tool making to symbolic behaviour. But arguments to a strong transition and no important progress on the fundamentals may find argument in the high quality of very ancient cave paintings. In some way, the trench before humans and other animals have been explicitly deepened by the winner variety, homo sapiens, pushing the Neanderthalians to extinction, and killing (for security or greed or biotope reduction) the high level mammals. Some fiction authors have dealt with the issue, for instance Vercors in Les animaux dénaturés (Albin Michel 1952) or, more recently Michael Crichton in Next (Harper & Collins 2006). The fear of confusion between men human and non human takes to create and clean up a sort of sanitarian zone around, and to feel ill at ease when some beings stay there. With machines, there is the "uncanny valley" phenomenon. And frequently derision, as exerted so brilliantly by Tinguely, for instance. At present, he gap between AI and human (even animal) intelligence is still wide. The computers are to day considerably more powerful than in Turing's times. But neurosciences have also shown that neurons in a human brain must be counted by hundreds of billions (ten times more than in the 60s, if my memory is correct). 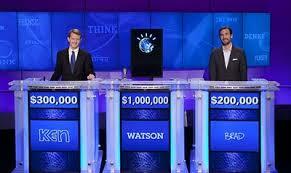 IBM's Watson machine wins the Jeopardy game (2011). Some kinds of AI have been real failures, mainly the "expert systems" in the 1980s-1990s. But several milestones have been reached, notably the Deep Blue victory over Kasparov. A lot of computerized processes are smart to high point . But it is no longer fashionable to talk of it. Even for Deep Blue, the book of... show the reluctance, even for the IBM sponsor, to highlight the victory. The victory of IBM's Watson machine at the Jeopardy game marked another important step. See our post. Here we must deal with a basic question : how far can a lot of words, at start devised for human features, be used about machines : intelligence, emotion, decision, sense/meaning, liberty, creativity... ? The basis of our answer is simple : as far as we know how to make the difference between men and machines, the use of these words for machines is a kind of metaphor, not without dangers, but useful and natural : we talk of a table legs, of a plane wings, etc. In some cases, it is prudent to mark the metaphorical character of this use. When and where the border blurs, one should be particularly prudent, but not self suppressive when these word support efficiently the thought process. The basis was explicitly formulated by Jesus : "And the King... shall answer... Inasmuch as ye have done it unto one or the least of these my brethren, ye have done it into me" (Matthew, 25,40) and Paul "There is neither Jew nor Greek, there is neither bond nor free, there is neither male nor female: for ye are all one in Christ Jesus" (Galatians 3, 29). Colonization from Renaissance to the 19th century made of it a practical reality. De-colonization may be taken as a step upward, with political equality completing the cultural sharing of the Christian heritage everywhere, and the importation of foreign cultures in the Christian Word. Even economic equality in some way progressing, but along with a growing gap everywhere. Globalization by private enterprise is perhaps doing more for global equality than the Christian message. Communautarism is condemned. Technological progress has contributed to realize the unity of mankind, e.g. physical transportation and information distribution (printing, then electronic communication, and more recently Internet). For a lot of people, the equality imperative forbids to look scientifically for differences between humans, specially on gender and race basis. Ethnic statistics are forbidden in France , but not in the US . They are anyway necessary for positive discrimination, which results are any way disputed. Even in the US , the statistical work of The Bell Curve (by Richard Herrnstein and Charles Murray, The free press, New York 1994) has been widely disapproved. The 19th century anthropology is considered as totally unfounded today. Genomics at first emphasized the unity of Human species. Recent progress may reverse the trend, showing that genetic mutation rate tends to increase, and not in the way of unity. - different countries may differ in legislation as well as in economic development ; principle of nationality in the XIX th century. Cujus regio, ejus religio from the 17th century (Westphalia Treaty, 1648). However, individuality must be preserved. Thou shalt not kill (even yourself). This law has always been subject to a lot of exceptions : self-defence, death penalty, legitimate war. Abortion and euthanasia have added new dimensions. - it gives way to early diagnosis of defects, crippleness or any innate defect, hence encourages systematic abortion of non-conform foetuses. Progress on this way will augment the responsibility of medicine professionals, family and the whole social body in choosing to give life or not. For death and handicaps, medicine give the way of keeping in life bodies in quite any state of deterioration. Then, death is more and more frequently the result of a decision, mainly by the medical doctor, with family concertation. We are going towards a world where death by accident and even illness becomes the exception, and explicitly decided end of life the rule. A general generalization to all nations seems in progress. Economical progress makes it possible to keep alive the dangerous individuals. More information is available to judge (with a notable contribution of genetic information). And more subtle penalties may be applied (electronic bracelet for instance). For animals, the law has for long times be more or less extended. Think for instance at the Buddha legend trying not to crush beetles when walking. But also a progressive extension to most advanced animals. To every animals for vegetarians (but evidently for bacteria). Shall we reach a point when even cutting corn will be considers shocking, and the only acceptable food synthesized from minerals? Mankind aided by machines would become autotrophic (Wikipedia). For machines, the law tends to be extended to advanced artefacts : historical monuments, some particular machines (at least samples of series in technological museums) and one hear talk about "robot rights". Thou shalt not create nor modify human beings, other than the "natural" way, by the union of man and woman, pregnancy and birth. At its extreme, this law prohibits any intervention, from abortion and birth control to any aided procreation techniques, and of course eugenics or even the voluntary choice of a sexual partner based on any other quality than "feeling" or "chance" ("coup de foudre"). Society cannot live without a minimum of control over sexual and genetic activities, would it be only to preserve women again the violence of men's impulses! Hence, there is here an immense "gap", which we can penetrate into, using all we have said above. The gap is frequently painful, physically, intellectually and morally. It for a part due directly to language : mankind needs language to be itself, but language is a finite tool and can never encompass the considerable complexity of beings, and specially of the most complex of all beings, mankind itself. But, like art uses the gaps to create and give style even to the most humble beings and actions, efforts in the philosophical, moral, social, and political dimensions spring hence to create civilization. As for the four human issues, how can we see progresses, hopes, or simply views for our present and future, in particular due to the some kind of exponential growth (see for instance our LHD hypothesis). The digital progress has to say as well about the internal text (genomics) as well as about the external (language and information technology). The end of 20th century was the moment of an encounter of the two human texts. That is perhaps the more complex issue, because here it is not just question of life and death, but of a set of choices about a future life. The more or less "eugenist" stand, about the normal genetic way or reproduction is extended by the possibilities of cloning and various genetic interventions. The issue is still more extended to modifications of body (if not of soul) by the vast range of techniques available, from drugs to chirurgy and to external implants be they biological (from other humans, from non human organisms) or not (artificial members, electronic chips). At one extreme, we let "nature" decide of everything. Few people can seriously stay in this position. A the other extreme, procreation becomes a form of engineering. The motivations themselves may range from the "highest general good" to racist endeavours as well as to fancy specification of the future chills as if it would be some kind of pet, the "design babies". See bio-art. Mankind shall have to trace its way into the wide space opened between these two extremes. The French law "Informatique et libertés" states (1978 law, Article 10) "Aucune décision de justice impliquant une appréciation sur le comportement d'une personne ne peut avoir pour fondement un traitement automatisé de données à caractère personnel destiné à évaluer certains aspects de sa personnalité. Aucune autre décision produisant des effets juridiques à l'égard d'une personne ne peut être prise sur le seul fondement d'un traitement automatisé de données destiné à définir le profil de l'intéressé ou à évaluer certains aspects de sa personnalité". In more general words : machine must not decide in human matters. They may be auxiliary tools, no more. In France, the speed recording of cars by radars and the automatic fine assignment to offenders has been, rather theoretically, tempered by naming a police officer on the fine advice. It remains that the power of machines and technologies have been considered as a threat for humanities for very long times. In Gn 4.1. Abel, the peaceful shepherd, is killed by Cain, which may mean "blacksmith". What is more troublesome is that this negative image plays a major role in the great mythological sagas of today, as Tolkien The Lord of the Rings of Starwars. When a first episode appeared on the screens, it could be hoped that R2D2 ant 6PO would play a significant role, and open exploratory views on the robot/human fringes. The mere fact that there were two robots, the first dustbin like and the other one more android, and that their speech modes had been carefully worked out encouraged these expectations. The rest of the saga let them down.
" - But you are telling me, Susan... that Mankind has lost its own say in its future. - It never had any, really. It was always at the mercy of economic and sociological forces it did not understand - at the whims of climate and the fortunes of war. Now the Machines understand them ; and no one can stop them, since the Machines will deal with them as they are dealing with the Society, - having, as they do, the greatest of weapons at their disposal, the absolute control of our economy. - Perhaps how wonderful ! Think; that for all time, all conflicts are finally evitable. Only the Machines, from now on, are inevitable ! " Asimov (as far as I know) did not elaborate further. Can men really accept that ? Utilitarianism may be considered as another condemned kind of reliance on machines to decide in human matters, if we take "happiness calculus" as programmable. I would personally conclude on the formal undecidabilty of human limits. A great lot of reflexion tries to find some decisive criterion which would, without possible discussion, trace the line between what is human and what is not, be it animal, machine, or birth/death. If there was such a "scientific" criterion, such a "proof", which could solve our conscience problems in birth control, euthanasia, decisions about animals or robots, that would mean that we would have designed a kind of machine to decide in our place. Can we really accept it ? That perhaps goes up to the point of preventing any scientific definition of mankind, of a human nature, if not as anti-nature. The human being is fundamentally the undetermined. And he alone can prove to himself, ant to other human beings that he belongs there. human, computer, when it is unpredicted ? The being will take part in the diagnosis, but is no more perfect in his role. From which level of being could we use the word "sin" ? We need a sufficient modelling of human attitudes in respect to bad. We find again the general issue a raising digital message, from the only go-no go bit to the long cry of the sad poet. - take is a spring-board for leaning. Sin is born with/from conscience. A certain way of understanding the "defect". Regularly, efforts are made to replace linguistic expressions by more intuitive symbols, less related to linguistic communities. That takes to mostly graphics systems of symbols, that may be very effective (road signs, for instance), but have rather narrow limits. The dialectics digitization/return to analogy (watches, multimeters), Richaud. But this way back is taken only for HMI, not interesting in EDI. A limit: electronic saxophone caresse, gestual control. Note remarks of d'Udine about small offsets aroud the exact measure. What would have he said about the sequencers quantizing ? Thesis. Due to the limitation of human senses, beyond some level of resolution, digital (discrete) is perceived as continuous. Images, and so more, moving images. The analogy slope of any code (more generally, of any construct), so digital be it, has something positive: it helps to use it in reasonable conditions. Let us take the French RNIPP code. A purely digital, optimized code would oblige, in any user system, a table giving the main features of any person. The present code, with its explicit and separate coding of gender and birth region, let rather simple machines do a lot of basic operations, without any external references. (Eventually, it was designed for the punched card machine systems which were operated in the 1930-1950's. Any progress in digitization implies an "externalization" of codes, which are parted from the messages, and perhaps from the exchange partners. At end, nothing would be kept in the messages as well as in the partners, but the fundamental bit which triggers the dialogue or the action. The "Go", or the push on the Nuclear bomb button. In practice, the optimal digitization degree depends on the cultural level of persons as well as on the technological level at which they operate. Analogy is pleasant. Examples and images give better conviction than abstract theory. But it works only in local conditions. Beyond their borders, analogies prove to be excessively fuzzy. And is not easily additive. Digital is rigid, but supports development and progress. Law begins by a formalization of customs. Then it organizes itself more formally, and ultimately in codes, as has shown Danièle Bourcier. And we shall go further in digitization. Mankind progress goes no longer with a radical betterment of the individual, but with better social groups (using more sophisticated technologies). A quantitative growth of these groups is good is growth is what is looked for, but demands evolution in communication technology (including "connectique"). It would be interesting to quantify this thesis, if it can be experimentally tested. How pleasant, and somehow perverse, it would be to prove that democracy is the best of systems ! - by statistical compensation of errors, which is not the case for lone leader. Human exceptional : conscience, immortality, complexity without space emotion, liberty. A. Malraux, Les voix du silence. Paris : Gallimard, 1951. (includes Le Musée imaginaire). A. Ducrocq, L’Ère des robots. Paris : Julliard, 1953. J. Itten, Art de la couleur. Paris : Dessain et Tolra 2004 . German original 1921-1961. P. Klee, Cours du Bauhaus, Weimar 1921-22, Contribution à la théorie de la forme picturale. Strasbourg : Musées de Strasbourg 2004. J. Schillinger, The mathematical basis of the arts. New York : Philosophical library, 1948. A. Burks, H. Goldstine and J. von Neumann, Preliminary discussion of the logical design of an electronic computing instrument. Datamation vol. 8, September and October 1962). The quotations are here extracted from a book of lectures reprinting these articles (G. Bell and A. Newell, Computer structures : readings and examples. New-York : McGrawHill, 1971). W. Weaver and C. Shannon, Théorie mathématique de la communication. Paris : CEPL, 1975. (original 1949). M. Serfati. La révolution symbolique. La constitution de l’écriture symbolique mathématique. Paris : Editions Petra, 2005. J.C. Kaufmann, Ego. Pour une sociologie de l'individu. Paris: Nathan, 2001, and J.C. Kaufmann, L’invention de soi, une théorie de l’identité. Paris :Armand Colin, 2004. C. Halpern (ed. ): Identité(s). L’individu, le groupe, la société. Paris : Sciences humaines éditions, 2009. R. Keucheyan, Le constructivisme, des origines à nos jours. Paris : Hermann, 2007. Quoted by Halpen, op. cit. For a comparatively easy presentation, see for instance A. Kojeve: Introduction à la lecture de Hegel. Paris : Gallimard 1947. This text is particularly pertinent here, since it was one of the roots of philosohical post-modernism, including the Japanese one. See a concise (but formal) presentation C.H. Smith, A recursive introduction to the theory of computation. Berlin: Springer Verlag 1994. J-A. N. Caritat, marquis de Condorcet, Esquisse d’un tableau historique des progrès de l’esprit humain. Paris: 1795. Recent edition, Paris, Editions sociales, 1966. S. Nora and A. Minc, L'informatisation de la société. Paris: La documentation française, 1978. J. Verne, In the year 2889. New-York: The Forum, 1889. R. Carmille, La mécanographie dans les administrations. Paris : Sirey. Première édition 1936. Deuxième édition 1941. The second edition is more interesting because it includes the acquisition form and then the content of the intended files, in particular the « jew or not » mention. A critical appraisal of this interesting episode has been made in J.P. Azema, R. Lévy_Bruhl and B. Touchelay, Mission d'analyse historique sur le système de statistique français de 1940 à 1945. Paris: Insee, 1998. M. McLuhan and Q. Fiore, War and peace in the global village. New-York: Bantam, 1968. W. Benjamin, L'œuvre d'art à l'ère de sa reproductibilité technique. in Essais. Paris : Denoël-Gonthier, 1971. T. Adorno, Aesthetic theory. London: Continuum 2002 (Original 1977). J.M. Schaeffer, L’art de l’âge moderne. L’esthétique et la philosophie de l’art du XVIIIe siècle à nos jours. Paris : Gallimard, 1992. Phil O, Level design for games. Creating compelling game experiences. Berkeley, New Riders, 2006. R. Powers, Plowing the dark. London: Vintage, 2002. H. Azuma, Génération Otaku. Les enfants de la post- modernité. Paris, Hachette, 2008. (Japanese original 2001). Since 2001, Azuma has written or contributed into several books, but they still have not been translated in English. These themes are studied in depth by the yearly review Mechademia, edited by Frenchy Lunning, University of Minnesota Press, 2006, 2007, 2008, 2009). An extensive bibliography (24 pages) is included in M.W. MacWilliams, Japanese visual culture. Armonk: M.E. Sharpe, 2008. M. Amerika, Meta/data, a digital Poetics. Cambridge: MIT Press, 2007. The invisible committee, The coming insurrection. Cambridge : MIT Press, 2009. Original, L’insurrection qui vient. Paris: La Fabrique éditions, 2007. C. Koch, The quest for consciousness. A neurobiological approach. Englewood (CO) : Robert and company, 2004. P. Rosanvallon, La légitimité démocratique. Impartialité, réflexivité, proximité. Paris : Seuil, 2008. Peter Sloterdijk. Sphères. 1. Bulles 2. Globes 3. Ecumes. Paris-Frankfurt Main : Fayard/Maren Sell. 1998-2002. J. Berger and P. Berger, Prospective et entreprise, 2028. in Entreprise 2018. Paris : Conseil Supérieur de l’Ordre des Experts Comptables, 2008. N. Magnenat-Thalmann and D. Thalmann, Handbook of virtual humans. Chichester (UK): Wiley and sons, 2004..
 D. Haraway, Manifeste cyborg et autres essais. Sciences - Fictions - Féminismes, Anthologie établie par Laurence Allard, Delphine Gardey et Nathalie Magnan. Paris : Editions Exils, 2007 . C. Ondrejka, Power by the people : user-creation in online games. In T. Alexander (ed. ), Massively multiplayer game development 2. Boston: Charles River, 2005.